The final aged event of the cutting horse season, the Calgary Stampede Cutting Horse Futurity, presented by Wrangler, wrapped up Sunday, October 13. 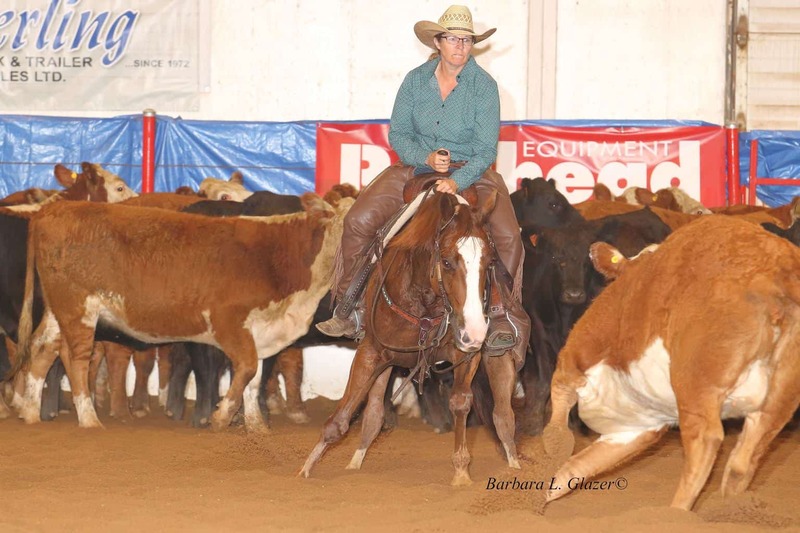 Competitors from across Canada and the United States came to show their horse’s cow sense and incredible ability in the futurity, derby, classic, and non-pro seven up divisions. Hot off the presses, here are the champions of the 2018 Calgary Stampede Cutting Horse Futurity. To read the insights and stories behind these incredible runs from the competitors themselves, be sure to grab a copy of the November/December issue of Western Horse Review, “The Champions Issue”, will be on stands and available at the beginning of November. Gerry Hansma and Justa Swingin Cat were the 2018 Open Futurity champions. 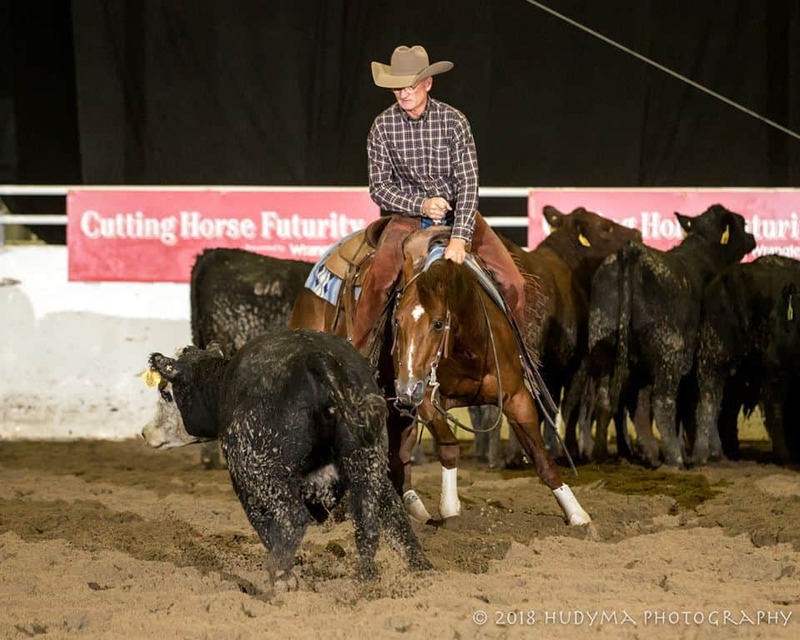 Gerry Hansma, Granum, AB, took top honours in the crown jewel of Canadian cutting when he piloted Justa Swingin Cat to the Open Futurity win. Justa Swingin Cat, owned by Dennis Nolin of Edmonton, AB, could not be bested when he put up a score of 222, earning $20,147.82 in the process. 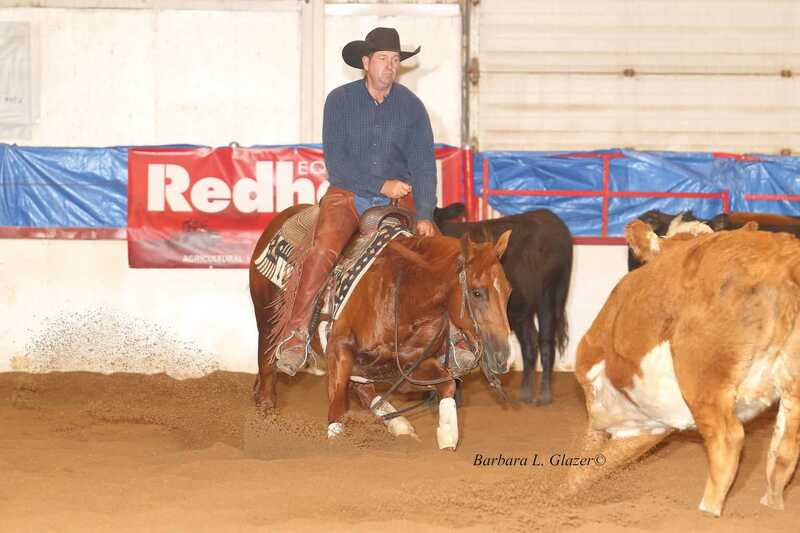 In the Non Pro Futurity class, Irricana, AB, cowgirl, Emma Reinhardt scored a 219 on the mare, This Cat Dreamin, owned by father, Doug Reinhardt. Reinhardt walked away with $6,559.94. In the Open Derby, the trip North paid off for Dax Hadlock, Oakley, ID, when This Cats Lethal posted a 222 to win $10,231.69 for owners, E Squared Performance Horses. It was a tie to take home the championship in the Non Pro Derby. Chad Eaton of Arcola, SK, and his mare, Come Away With Me, posted a 215 on the leaderboard. Samantha Goodman of Liberty, UT, followed directly after on her gelding, Crimson Coug, to post the same score. Both competitors won $6,821.13 for their co-championship title. Eaton also took home the $50,000 Amateur title in the Derby division. Under the Saturday night lights of the Nutrien Events Centre, Travis Rempel of Fort Langley, BC, ensured tough cows didn’t get the best of him. Aboard NVR Reylena, owned by David Paton, Abbotsford BC, the duo scored a 222 to win $12,278.42 in the Open Classic. Heather Pedersen and Downtown Calico were co-champions in the Non Pro Classic. In the Non Pro Classic, two Alberta competitors were crowned victorious. Matt Anderson, Sturgeon County, AB went first in the herd on his mare, Catatulla, to score a 222. Heather Pedersen, Lacombe, AB followed in the middle of the pack on her mare, Downtown Calico, also posting a 222. Both competitors received cheques for $12,278.42. In the $50,000 Amateur division of the Non Pro Classic, Doreen Ruggles, Ardmore, AB, and Hala Cat walked away with the champion title. 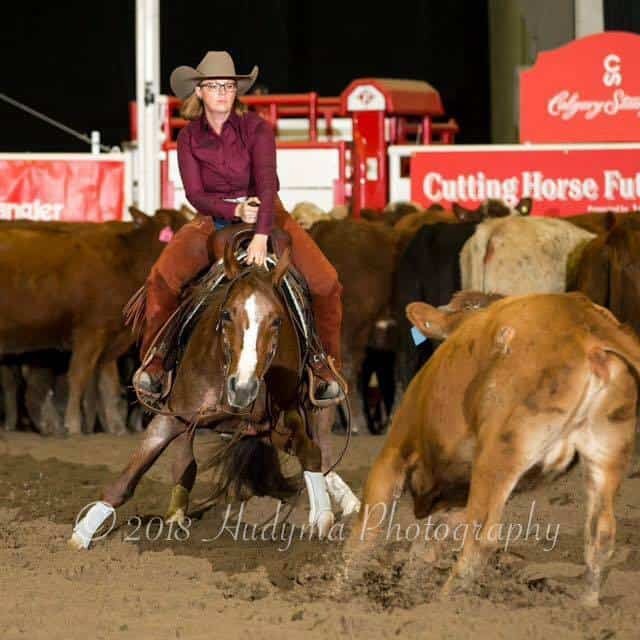 To finish up the exciting competition at the Calgary Stampede grounds, Amanda Digness, Millet, AB, and her gelding, Reys of Moonshine took home the Non Pro Seven Up title. Digness marked a 220 that could not be bested and earned $3,257.10 for her efforts. First Futurity Results Are In! Submitted by Elaine Good, Photos Courtesy of Barbara Glazer. Glen Beveridge rides NRR Coles China Doll to the Open Futurity championship. The first two days of the Moose Jaw Cutting Horse Show were dedicated to the Limited Age Event. These are classes restricted to horses just beginning their show careers and competing against horses of the same age for over $12,000 in prize money. It’s also the very first time for the three year olds to be shown and it’s amazing to watch these youngsters! This event is organized by the Saskatchewan Cutting Horse Association to help breeders, trainers and owners develop and showcase their horses and programs. It’s held at the Golden Mile Arena in conjunction with the 4 day Moose Jaw Cutting Horse Show where the facilities and great footing allow these horses to show their full potential! The Barry & Elaine Good Open Futurity Aggregate went to “NRR Coles China Doll” for owner Warren Russell, Stoughton, Saskatchewan under the saddle of Glen Beveridge, Valley View, Alberta. 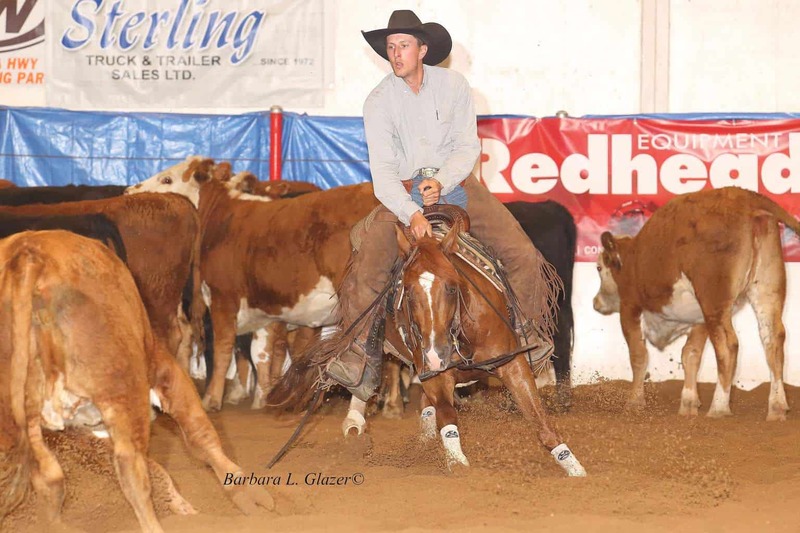 Glen saw this 3 year old mare sired by “NRR Cat King Cole” and out of the mare “Chinas Instant Choice” being worked by Cody Smith at Ponoka, Alberta which prompted a phone call to Warren. Warren said “If you think she’s a good one go ahead and buy her.” He never saw her until she was shown at Moose Jaw! This mare is real sweet to be around and they hope to keep her feeling good and keep showing her through the fall futurities. They want to thank everyone who helped along the way including Clint Christianson, Tyler Darroch and Mike Belof. Thanks from GD Cutting Horses! 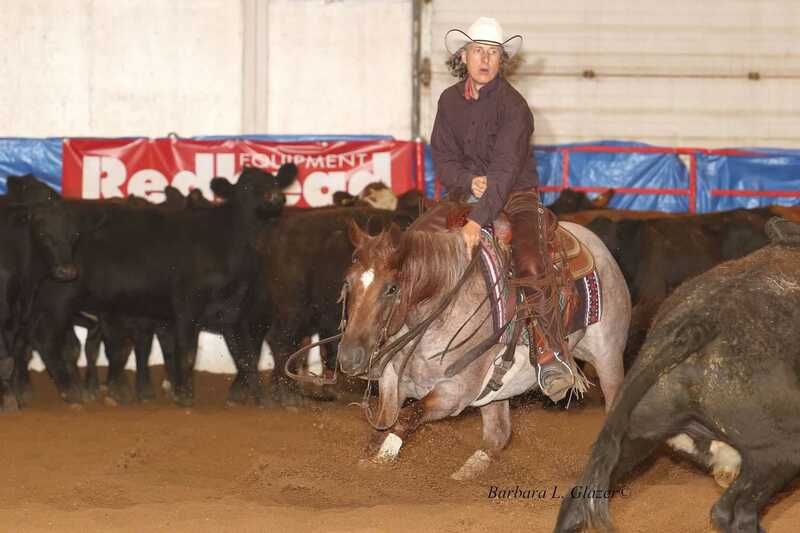 Elaine Speight was the victor in the Non Pro Futurity with her great mare, Hickory Boonlight. The 3 Year Old Non Pro Futurity Aggregate also sponsored by Barry & Elaine Good was claimed by the accomplished showperson, Elaine Speight riding “Hickory Boonlight” owned by Bill & Elaine Speight, Rocky Mountain House, Alberta. The Speights found this blue roan mare, sired by “Boonlights Shining” out of the mare “QR Duals Hickory” advertised on the northernhorse.com website. 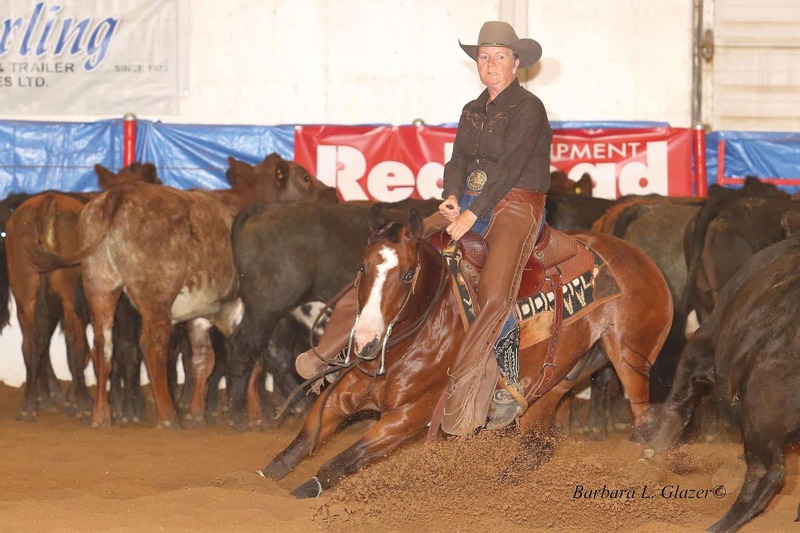 They purchased her in the fall of her yearling year from Jennell Heptner and had “Boony” started by Anna Petrova of Strathmore, Alberta, as a two year old. Bill continued with training her on cattle, then the flag during the winter and more cattle work into her 3 year old year. The Speights were happy and proud that she did so well at the Moose Jaw Show. With her size, strength in the hind quarters and tremendous long stride they feel she has the potential to make a great horse. Hesa Rey Cat is a stallion with serious potential, after taking home the derby title with Clint Christenson aboard. The 4 Year Old Open Derby Aggregate went to “Hesa Rey Cat” owned by the class sponsor Kali Fortner, Bracken, Saskatchewan! Kali’s partner, Clint Christianson trains and shows “Hesa Rey Cat,” the sorrel son of “Dual Rey” that they purchased from Montana Ranch Cutting Horses of Big Fork, Montana. “Hesa Rey Cat” is the third colt that Clint has had the good fortune to train out of the great producing mare “ Shes A Cuttn Cat” and they look forward to his potential both as a show horse and stud prospect. RH Purralator Cat made breeder and owner, Sandy Reid, proud, by taking home the Non Pro Derby win. 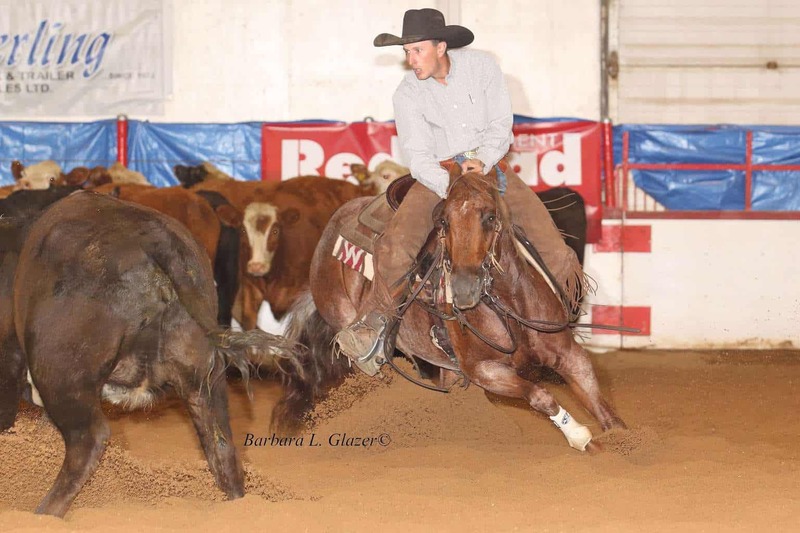 Hot Metal Smarts showed off her cow smarts winning the Open Classic for rider, Glen Beveridge. “Hot Metal Smarts” returned to Moose Jaw after winning the 2017 Open Derby to take this year’s Les & Coreen Jack 5/6 Year Old Open Classic under the saddle of Glen Beveridge. This 5 year old mare by “Metallic Cat” out of the mare “Jazzy Jay Bar” was bred and owned by Hollingworth Farms Limited of Valley View, Alberta. This mare has really come on nice this year and they hope to keep her going for the fall futurities. The Non Pro Classic championship went to Scott Brady aboard One Cuttin Cat. Tazalittle and rider Carol Bailey finished off the aged event by captured the 7 Up Champion title. Full results of the Moose Jaw Cutting Horse Show and Limited Age Event are available on the SCHA Website: www.scha.ca.